Sometimes you come across a deal that’s simply too good to pass up, and that’s exactly what’s happening to you right now. 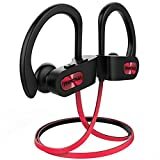 You would have to be positively nuts to pass up the Mpow Flame Bluetooth Headphones while they’re on sale for just $15.99. These fantastic water-resistant earbuds have been best-sellers on Amazon for nearly two years now, and they’ve managed to amass more than 8,100 5-star reviews on the site. Tens of thousands of our readers have purchased them over that period of time, and they almost all paid more than you will today because this is within $1 of the lowest price we’ve ever seen. Get them for yourself or get them to give as a gift, just get them before the $4 coupon on the Amazon page goes away.